I've reviewed and tasted a few unaged and/or barely aged white lightnings, white dogs, white whiskeys, moonshine or whatever you want to call them over the past couple of years. And generally, they're a bit underwhelming and overly sweet. The only exception was Germain Robin's Low Gap whiskey which is far and above the best white whiskey I've ever tasted. So now, we have another in the lineup, The Georgia Moon Corn Whiskey. 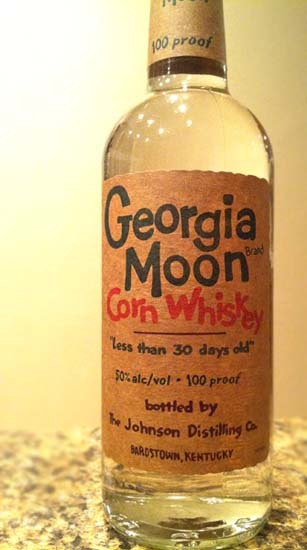 Georgia Moon Corn Whiskey is a pure corn whiskey produced in Kentucky by the Johnson Distilling Company. I got a real bottle of it, but I've also seen it come in a mason jar. Granted, this isn't real moonshine of course, but it is a corn whiskey (like most real moonshine) and is aged less than 30 days. And why is it Georgia Moon when it's distilled in Kentucky? I haven't a clue. Maybe they thought Georgia sounded better and perhaps Georgia is more of a moonshiner state. As most of you know, bourbon has to be at least 51% corn to be considered bourbon. Corn is what gives bourbon its signature sweetness. But, there's a reason why distillers mix rye, barley, and wheat into the mash, because on it's own corn whiskey can easily become cloyingly sweet. Granted, aging in oak will tone down the sweetness and add new lovely notes, but for white whiskey, the aging isn't long enough to do much. Georgia Moon Corn Whiskey pours crystal clear like vodka, gin, or white rum. It smells strong and sweet and very much of corn liquor, corn syrup, and a bit of rubbing alcohol and gasoline. And while that might sound unpleasant, I actually kind of like the smell is some weird sort of way. But then again, I'm kind of a freak. Tasting bring something akin to the flavors of eating creamed corn with corn syrup drizzled on top, with an oddly ether-like alcohol burn and a short finish that doesn't linger at all. All in all, not the best white whiskey I've ever tried. Not even close. Not even in the top 5. But, I'll still drink it. Yes, it's cloyingly sweet and a bit harsh. But if you want to be able to pick out the sweet corn notes both in aroma and taste in whatever bourbons you try, I recommend at least trying it. Drinking it to help your tasting abilities is a lot like trying different things (ex. cigars, stone, dirt, currants, various berries) to help you better taste wine and pick out the notes, and I'm all for that. Drink This: if you want to try a relatively cheap (about $14) barely aged corn whiskey/white dog/white lightning. Like I said, even if you don't like it, it'll help you better pick out the corn notes in bourbon. Don't Drink This: if you're looking for a white dog that isn't overly sweet, because this one most definitely is. I don't think I've ever tried corn whiskey. I am more of a beer drinker myself. I like Jamaican Red Stripe beer and Japanese Asahi beer. One of them is a dark beer while the other is light. Two different tastes. I would like to try whiskey one day, however I somehow always associate whiskey with drinking among older men. Maybe it is because that's who I saw drinking whiskey growing up. great comment jackass. this isnt about bee and or your hipster preferences. drinking a jar now. Strong corn sweetness with gasoline and a little pine. all in all not bad, but doesn't take your breath away like the "real" moonshine i have had. it ages very nicely i am about to take the last drink of a bottle i bought in 1976 just after i got married. i have another jar aging about 7 years old and not open yet. it does remind of the stuff my family use to make. Not the best I have ever had . For a true 100% corn whisky I like Platte Valley in that great Jug !!!!!!!!!! Let me start off that if you are a whiskey snob you most likely will not like this because there is no charred oak flavor from being aged in barrels. Now that we have established that, I can say that this is one hell of a unaged moonshine spirit. I have tasted many moonshines both off the store shelf in Gatlinburg, Tennessee and also from the backwoods out of an unlabled mason jar. Georgia Moon has an incredible corn flavor. It is not about high proof or to get you black out drunk. It is simply a smooth unaged corn liquor. If you buy moonshine that is made from neutral spirits, you with get a liquor that tastes very much like vodka or rubbing alcohol. This is best served chilled and sipped on while relaxing after a long week. Not to chug or to take as shots, but sipped and passed around with your friends around a bon fire. I have bought many jars and plan to continue buying them! Introduced this to some co workers when work took us to Oak Ridge, TN for training for a week. Mixed it with some diet Dr.Pepper for those who couldn't take it straight (this was the hundred proof, not the 80). Good time had by all. Smooth.